Does your garage plan include 100% usable space and a structure that will keep your valuables safe and secure? Or does your garage plan emphasize an attractive appearance or easy do-it-yourself construction? 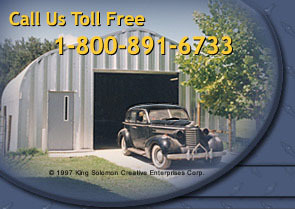 An American Steel Span steel building is the perfect solution to any of your garage plans. Individuals looking for ways to fulfill their garage plans often turn to American Steel Span to meet their needs. An American Steel Span building is a versatile construction option that goes up quickly without the need for expensive tools and equipment and lasts a lifetime. Pull out those garage plans and call one of our helpful representatives today and those garage plans will be a reality in no time!